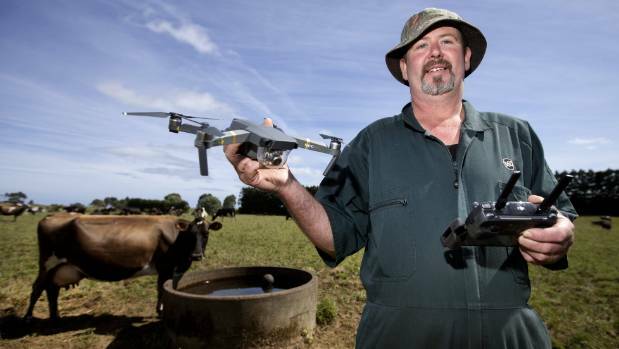 An enterprising Taranaki farmer isn’t following the herd when it comes to innovation – he’s flying above it instead thanks to a $1000 drone aircraft. Hayden Fowles, who farms 12km south of New Plymouth, said high-tech help is proving invaluable when it comes to herding his 188 Friesian cross cows for milking, saving time and helping him spot sick animals. Set on 75 hectares, Fowles’ farm is a mix of flat and rolling paddocks and travel by two wheeler farm bike can be hazardous on a wet day, he said. But Fowles said his eye in the sky allowed him to follow the cows from above as they headed to milking each afternoon. “I have an automatic gate timer set to open the paddock gates at 2.50pm, and I set the drone up soon after that to follow them,” he said. The technology is saving him between 40 minutes to an hour a day in herding the cows. “It’s a lot quicker now than when I had to use the bike. “I was having to get off the two wheeler and doing a lot of walking to get the cows in for milking, especially on some of the hillier paddocks. Fowles can identify any lameness, or sickness in the herd a lot sooner than if he was on a bike, or foot. “The lameness rate has been cut back dramatically,” he said. Although he had heard of cows bolting when a drone was above them, Fowles said his herd were not disturbed by the drone overhead. The battery powered Mavic aircraft flies at a maximum 100 meters above the herd, meaning Fowles doesn’t have to alert civil aviation authorities when he is flying it. He referred to the Airshare website for aviation guidelines. He doesn’t operate it during early morning milkings when the light is poor. But what he is really excited about is the improvement in health and safety – a daily issue for farmers. “The drone is more of a safety thing for me. “It means a lot less time I’m on and off the two wheeler and I don’t need to go on to the steeper land.